Intimidation Clothing is pleased to announce its sponsorship of the upcoming Indestructible Fight Club event, which is set to take place on May 10 in Owensboro, Kentucky. No stranger to the promoting game, the organization has previously promoted events under the Indiana Fighting Championship banner – including a kickboxing event last weekend – in Indiana. Promoter and owner Kyria Christison recently appeared on Bluegrass MMA Live to discuss the event, which is currently slated to feature a baker’s dozen of amateur bouts. The night’s main event features a pair of veteran lightweights, as Joshua Stanley (8-4) takes on Michael Ricketts (8-4). The event will be covered by Intimidation’s Kentucky/Indiana crew, which is in for a busy month of May. The crew will be on hand selling Intimidation’s popular brand of t-shirts, hats, hoodies, fight shorts, and more. Intimidation Clothing is pleased to announce its continued partnership with Hardrock MMA, which will move forward later this month at Hardrock MMA 61 in Bowling Green, Kentucky. The sponsorship of the event continues Intimidation’s foray into the Bluegrass State, which includes selling at the show. Hardrock MMA is one of the biggest and longest running MMA events in Kentucky, holding more than 50 events in the state and their second event in 2 weeks with HardRock 61. The event features a pro and amateur lineup, including at least 3 pro bouts. Notably, 52-fight amateur veteran Jeremy Philpot will finaly make his pro debut at the event. The event also features some of the best amateur fighters in the Ohio Valley area. While the Intimidation brand is no stranger to Kentucky MMA having sponsored events across the state as well as having worked with undefeated UFC bantamweight Jessamyn “The Gun” Duke (3-0, 1-0 UFC). Intimidation Clothing has also been a sponsor of XFC, Absolute Action MMA and Spartan FC events in the past few years as well as numerous fighters from the state and at events inside the borders of the Bluegrass state and is a long-time sponsor of the popular BluegrassMMA.com MMA news site. Intimidation Clothing is pleased to announce its continued partnership with Hardrock MMA, which will move forward this weekend at Hardrock MMA 60 in Shepherdsville, Kentucky. The sponsorship of the event continues Intimidation’s foray into the Bluegrass State, which includes selling at the show. Hardrock MMA is one of the biggest and longest running MMA events in Kentucky, holding more than 50 events in the state. The event features a pro and amateur lineup, including a headliner featuring Bellator MMA veteran Ron “The Monster” Sparks (5-3) in heavyweight action against Joshua Clark (0-2). Also on the card will be “The Ultimate Fighter 14” veteran B.J. Ferguson (9-4), as well as his unbeaten brother Isaiah Ferguson (4-0). The event also features 3 amateur title fights. While the Intimidation brand is no stranger to Kentucky MMA having sponsored events across the state as well as having worked with undefeated UFC bantamweight Jessamyn “The Gun” Duke (3-0). Intimidation Clothing has also been a sponsor of XFC, Absolute Action MMA and Spartan FC events in the past few years as well as numerous fighters from the state and at events inside the borders of the Bluegrass state and is a long-time sponsor of the popular BluegrassMMA.com MMA news site. Two of the most respected local MMA media outlets have joined forces, as BluegrassMMA.com has acquired OHMMA.com. Originally covering separate markets in Kentucky and Ohio respectively, both outlets had expanded to cover Indiana, Tennessee, West Virginia, and Western Pennsylvania. Now, the two sites will be together under the same umbrella, which will all be housed at BluegrassMMA.com. 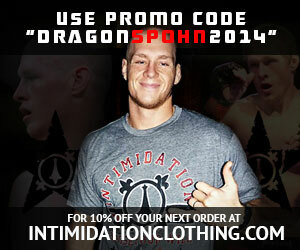 Intimidation Clothing has long been a major supporter of local MMA, including advertising on both sites. With the union, Intimidation plans to continue to be a major supporter of BluegrassMMA in 2014 and beyond. Former OHMMA.com senior editor and co-owner David McKinney will join Gary Thomas and Juan Valle at BluegrassMMA, where the three will cover events in the Ohio Valley region. Intimidation Clothing continues its foray into the Bluegrass State, as the popular clothing brand will once again travel to Kentucky this weekend to sponsor and sell at the Hardrock MMA 57 event in Shepherdsville, Kentucky. Hardrock MMA is one of the biggest and longest running MMA events in Kentucky, holding more than 50 events in the state. The event features a pro and amateur lineup, including a headliner featuring UFC and “Ultimate Fighter 14” veteran Joshua Ferguson (8-5). Three amateur titles will also be on the line, including a highly anticipated welterweight title bout featuring Brandon Hurst (6-2) vs. Quinton Parks (10-7). Hurst, a law enforcement officer, will be sponsored by the Intimidation brand for this fight. While the Intimidation brand is no stranger to Kentucky MMA having sponsored events across the state as well as being a main sponsor for undefeated female fighter Jessamyn “The Gun” Duke (2-0-1), and this will mark just the third event in which Intimidation has worked with Hard Rock MMA. Intimidation Clothing has also been a sponsor of XFC, Absolute Action MMA and Spartan FC events in the past few years as well as numerous fighters from the state and at events inside the borders of the Bluegrass state and is a long-time sponsor of the popular BluegrassMMA.com MMA news site. In addition to sponsoring the event, the Intimidation crew will also be on hand selling its popular brand of t-shirts, hats, hoodies, and more. Intimidation Clothing is pleased to announce that it will sponsor and sell at the upcoming “Tri-State Showdown,” which takes place this weekend in Evansville, Indiana. Promoted by MMA Xtreme and Fists Will Fly, the event features a deep lineup of multiple big show veterans and is also a 2-day event featuring multiple performances by country artists and appearances by MMA champions like Chuck Liddell, Tito Ortiz, and Cris “Cyborg” Santos. Intimidation has had an increased presence in the Indiana and tri-state area, including sponsoring events like HOOKnSHOOT in Evansville, and also sponsoring BluegrassMMA.com, which covers the tri-state area fight scene. The event is expected to include names like Strikeforce veteran Billy Evangelista, UFC veteran Efrain Escudero, Strikeforce veteran Nate Moore, Bellator veteran Dom Steele, and many more. Along with serving as a sponsor for the event, Intimidation will also be on hand selling its popular brand of t-shirts, hats, hoodies, fight shorts, and more.